Anterior knee pain (literally “pain at the front of the knee”) is common and can be caused by a variety of conditions: injury to the joint, arthritis, and maltracking of the patella, softening of the articular cartilage (Chondromalacia patella) and instability or maltracking being the most common. Patello-femoral pain is a poorly understood but very common clinical complaint. It is often referred to as Anterior Knee Pain and can be caused by a variety of conditions. Problems related to the soft tissues of the extensor mechanism (quadriceps muscle and tendon, patella and patella tendon) and any imbalance can give rise to pain. More significant damage to the cartilage of the patello-femoral joint whether localised to a small area or in a more generalised distribution such as in arthritis can occur. When pain originates from the patella-femoral joint it is exacerbated often by activities when the knee flexed. In daily activities patients often describe their symptoms becoming worse when descending stairs or hills, although this is not exclusive for patello–femoral disorders. Many patients with pain at the front of the knee can be significantly improved with non-surgical treatment. After taking a full history of the problem, an examination of the knee is performed to look at the tracking of the patella, the strength of the muscles above the knee, the tightness of the tissues around the patella and areas of tenderness. Specific tests may also be used to assess the patello-femoral joint. It is often necessary to take x-rays of the knee, sometimes using multiple views. More sophisticated imaging including MRI or CT scans may sometimes be required. Pain felt at the front of the knee, with no obvious cause goes by a variety of names; patello-femoral pain syndrome, chondromalacia patella and anterior knee pain syndrome. Many now prefer to call it anterior knee pain syndrome (AKPS) as it is simply a description of where the pain is located. Anterior knee pain syndrome (AKPS) is a diagnosis where there is no identifiable cause of the pain. The important thing is that AKPS should only be diagnosed when all other pathologies have been excluded. Non-operative treatment: The majority of pain at the front of the knee can be resolved with non-surgical treatment. This treatment is directed at improving the balance of the patella at the front of the knee and normally involves physiotherapy and a home exercise programme. Operative treatment: In some cases surgery may be indicated. The size and the extent of surgery will vary according to the underlying problem. This may be performed arthroscopically (keyhole) or in some cases will require a larger open operation. Osteoarthritis can affect the patello-femoral joint in isolation or more commonly be a part of a generalised process that affects the whole of the knee joint. Less than 5% of people with osteoarthritis of the knee joint have it affecting solely the patello-femoral joint. The treatment principles are the same as for other knee arthritis and sometimes joint replacement is required. If the arthritic changes are confined to the patello-femoral joint consideration for a partial rather than full knee replacement can be given. Patients with patella instability report a number of common symptoms. They often complain of lacking confidence in their knee and/or experience the sensation of the patella sliding out of the joint. There are several types of abnormalities that may give rise to this problem. The patella may develop a tracking or centring problem within the joint, sublux (the partial slip out of joint) or completely dislocate out of the trochlea groove. A tracking problem occurs when the patella no longer remains centred in the front part of the femur known as the trochlear groove. 1. Bones – the shape and size of the groove and the patella. The groove may be shallow or absent. In addition, the position of the patella- a “high” patella (also called “patella alta”) is more likely to be unstable. 2. Ligaments – particularly the “medial patello-femoral ligament”- MPFL, attached to the inner side of the patella. This acts like a check rein, stopping the patella moving outwards too far. 3. Muscles – the vastus medialis obliquus [VMO] muscle of the quadriceps pulls the patella inwards, and the vastus lateralis muscle pulls outwards. Other muscles that act across the knee are also important, for example, the hamstrings. There needs to be a balance of these forces to keep the patella centred. Problems with any one of the above three factors might cause the patella to move laterally [towards the outside] within the trochlear groove. When the patella subluxes within the joint, it slips to a point where the patient often feels that it is unstable, but restricting further movement may prevent further displacement. With recurrent episodes of patella subluxation, patients frequently lose confidence in their knee joint and avoid certain activities as a consequence. Post-traumatic instability: patients who had a normal knee until an injury. For instance, some injuries sustained in contact sports may force the patella to dislocate outwards. The bones are normal, but an important stabilising ligament, the Medial Patello-Femoral Ligament (MPFL), is torn and the muscles may be weak. Recurrent episodes of dislocation may occur in the future following the initial injury. Developmental instability: Unfortunately, some patients, particularly adolescent girls, are prone to patella instability. The most common cause is an absent, or even domed, trochlea groove, combined with a high patella. This means that there is an inborn high risk for the patella to be unstable. Poor muscles and a weak or stretched MPFL may be the last straw. Before a management plan is decided, an accurate diagnosis and an assessment of any associated secondary injuries to cartilage or bone needs to be established. Following diagnosis, a supervised course of physiotherapy normally returns most individuals to pre-injury levels of activity. The muscles can be toned and balanced to improve tracking and stability. Recurrent episodes of dislocation of the patella need specialist assessment to establish the underlying cause. An abnormality of the bones and soft tissues of the hip, knee, foot and ankle can all contribute to persistent problems. Therefore, it is essential that the patient is assessed fully. Initial treatment is non-operative and addresses muscle imbalances. Surgery may be require for on going problems and may address soft tissues or bone abnormalities. This will require a detailed discussion with the treating surgeon. Trochleoplasty- deepening of the trochlear groove. allowing for low friction movement when bending and straightening the knee. The patella is a specialised type of bone called a Sesamoid and is the largest of this type in the body. Sesamoids are bones that are embedded within tendons and located where a tendon crosses a joint. Sesamoids improve the function of a joint by altering the mechanics so less effort is required when moving it. (They improve the mechanical advantage of a joint by increasing the lever arm and transmitting forces at a greater distance from the axis of rotation). 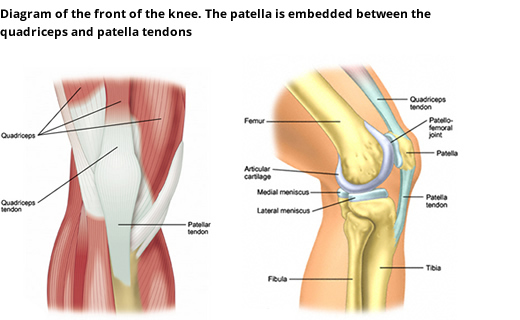 The patella is embedded between two tendons: the quadriceps tendon (from above) and the patella tendon, which extends from the lowest point of the patella to the tibia. The majority of symptoms that are experienced by a patient caused by problems with the patella femoral joint are due primarily to pain or a feeling of instability.